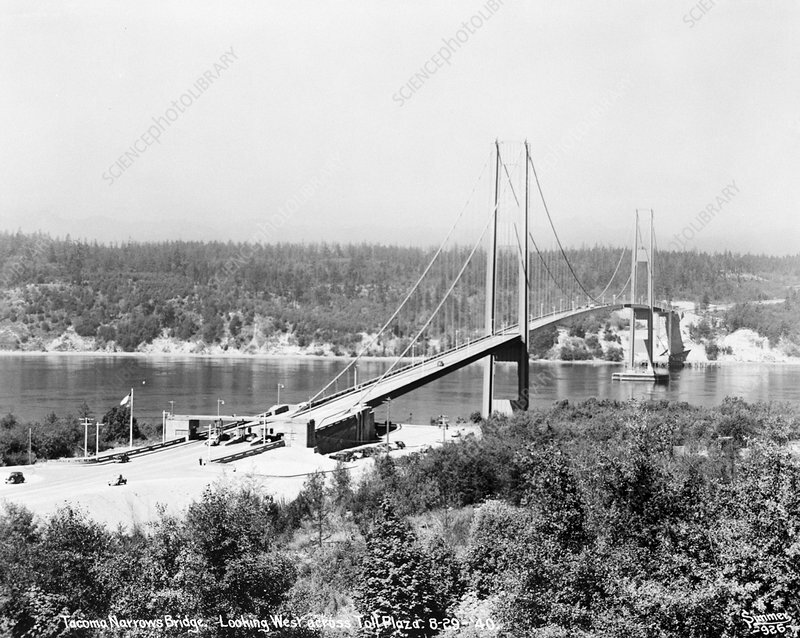 First Tacoma Narrows Bridge. This road suspension bridge spanned 1810 metres across the Tacoma Narrows strait in Puget Sound, in the US state of Washington. Designed by Leon Moisseiff and Clark Eldridge, it opened on 1 July 1940. This photograph, looking to the west, was taken on 29 August 1940, with the toll (lower left) on Primary State Highway 14. The bridge collapsed on 7 November 1940, due to oscillations caused by aeroelastic flutter in gale-force winds. This collapse was captured on film (see images C013/1938-1941). This photograph is part of the Historic American Engineering Record (HAER).